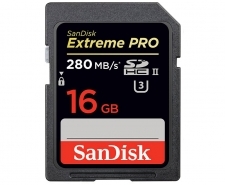 Designed to meet the demands of professional photographers and videographers, the SanDisk Extreme PRO SDHC/SDXC UHS-II Memory Card is the world's fastest SDHC/SDXC memory card. Read speeds of up to 280MB/s** help you maximize post-production workflow efficiency so you stay competitive, while write speeds of up to 250MB/s** support advanced camera functions such as continuous burst, rapid shooting, and RAW plus JPEG capture. This memory card is an ideal accessory for the new generation of UHS-II-enabled DLSRs and video cameras. With a UHS Speed Class 3 rating--faster than UHS Speed Class 1 and Class 10--the SanDisk Extreme PRO SDHC/SDXC UHS-II Memory Card gives you the power to capture uninterrupted, cinema-quality 4K, 3D, and Full HD video at a minimum sustained write speed of 30MB/s**. Available in capacities of up to 64GB**, the card gives you more room for capturing RAW plus JPEG, sequential burst shots, and high-definition video. You'll be able to capture a whole shoot without interrupting the session to upload your photos or video.